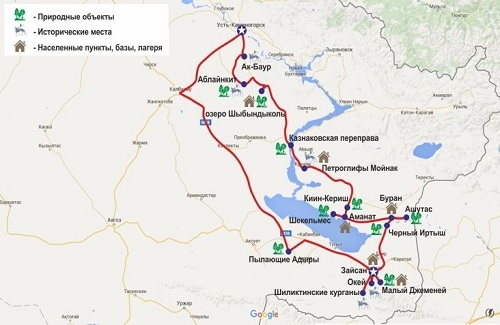 MAIN GEOGRAPHIC POINTS: Ust-Kamenogorsk city – Akbaur temple complex – Shybyndykol Lake – “Moinak” petroglyphs – Kiin-Kerish – Shekelmes Cape – Ashutas canyon – Zaisan – Small Dzhemeni tract – “Okay” petroglyphs – Chiliktinskaya Valley – a natural object “Burning Adyr” – Ust-Kamenogorsk. Recommended equipment: clothing for hot and cool weather, bathing suit, bag, shoes for trekking, sunglasses, insect repellent, photo and video equipment, fishing equipment. PRICE OF TOUR: price on request. The journey starts from Ust-Kamenogorsk city. We drive to the Samara village, which earlier was called Leninka, and now is named as Sagyr. 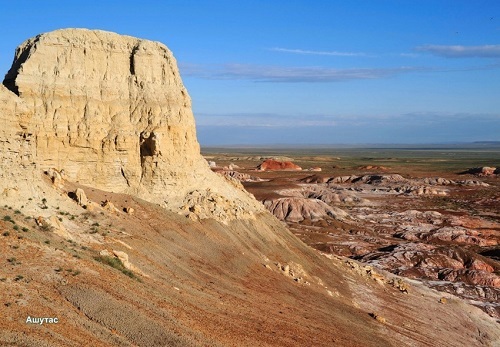 Here, near the village traveler will be able to immerse themselves in the ancient world of the Kazakhstan Stone Age. 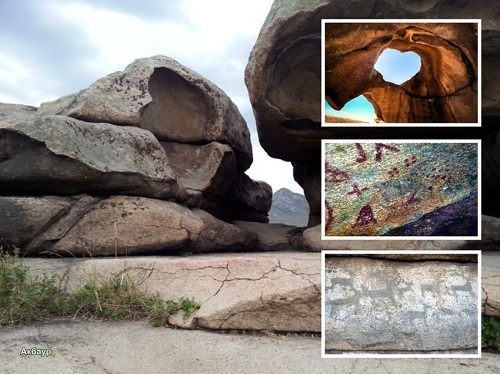 Sacral complex Akbaur ready to present its ancient astronomical observation site, rock paintings and petroglyphs. Various researchers have put forward many theories about the purpose of the temple complex. Someone thinks that our ancestors performed the funeral rites here. Others argue that the temple Akbaur – the offspring of the cult of the mountains. Others called Akbaur was an astronomical complex, and hence from there ancient people monitored over a starry sky. Next point is Sibinsky lakes. Besides the amazing scenery that surrounds the complex of five natural reservoirs, tour participants can wander through the ruins of the medieval (XVII century) lamasery Ablaynkit. Legend says that somewhere in these places, before leaving the sanctuary, monastery servants hid all their treasures under the walls. They still have not been found. After a walk around the monastery of Ablai car takes travelers to the shore of scenic Lake Shybyndykol located near the village of Upper Tainty. 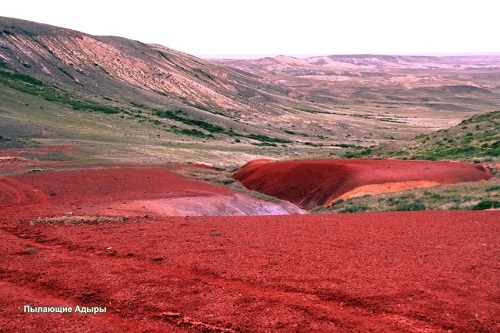 There natural beauty of East Kazakhstan begins to unfold. Clean cool lake, shore covered with mixed forest, peace and quiet. This is a place you do not want to leave. It is necessary to carefully examine all, swim and lie on the beach, watching the sunset. The night we will spend in the houses located in the tourist center. Samara road trip continues. The road lies in the hills, visible from the vast expanses of the Eastern Kazakhstan. This part of the journey ends at the ferry terminal near the village Kaznakovka. We need the other side of Bukhtarma reservoir. The ferry passes the car and its passengers, you can have a cup of coffee at cafe or do some memorable pictures on the background of a large artificial reservoir formed by the construction of hydropower plants on the river Irtysh. After successful voyage road leads to the village Kurchum. 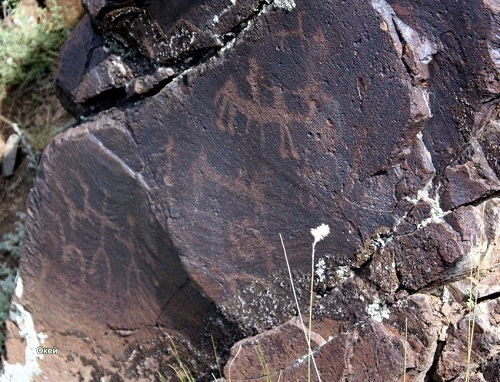 Not far from it stretches the biggest gallery of petroglyphs in East Kazakhstan. Set of images of people, animals, hunting scenes and battles await us in the open air. Ancient artists with rock paintings tell about their culture, customs, and way of life. There are over four hundred stones. They contain more than three thousand drawings. Next, we are expecting for a small tour of the outlying administrative center of Kurchum district of East Kazakhstan region. We will get acquainted with the life of the Kazakh people and stop for the night in a comfortable hostel. The purpose of our journey is away from paved roads. Travelers at this stage of the journey will be met by the panorama Zaysan steppe. Soon, however, the ordered steppe world is broken by chaos of the broken clay hills Kiin-Kerish. Riot of red and white shades capture the imagination. And even none of us had ever been on Mars, in this place you can easily imagine yourself as an astronaut walking on the surface of the red planet. Among the bizarre formations you can find hills like a yurt or Egyptian sphinx. You can climb to the top of the hill and see the splendor of it all from above. And it is possible for a long time wandering in the maze of red clay. Lunch we will have in a nearby village Amanat. Villagers ply fishing. This is a great opportunity to get acquainted with the famous Kazakh hospitality and hear a lot of interesting stories from the lives of ordinary fishermen. The next point of our trip is Shekelmes Cape – another natural wonder on the Zaisan lake. “Mountain Spirits Castle”. It is a clay and sand mountains, weathered and washed by rain, which froze in various forms. At the sections of Shekelmes canyons you can find a bone of fossil crocodiles, salamanders, dinosaur egg shells, remains of ancient plants and much more. And on the shores many tourists collect fragments of transparent gypsum memory, polished by waves. Sunset is unforgettably beautiful. The nights are filled with saturated pungent aroma of desert grasses, warm breeze and the sound of waves. To see all of this and feel it we will stop in a tent camp on the lake. In the case of rainy weather divide set tents in the caves. The day begins with breakfast. We will drive along a country road some kilometers to the west along the coast of Zaisan. At the end of the way we arrive at the natural landmark, situated near the river Black Irtysh. Ahutas is big. Its research and admiration may take all day. The name of this tract was due to a specific smell, which is recovered by the charred plant remains. In the Kazakh language it means “sour stone”. However, the air is clean and fresh. Ashutas is a valuable paleobotanical geological monument of nature and is about one hundred and fifty acres. Although it seems evident from a distance, it appears suddenly. The scenery is breathtaking. There is a feeling that you have a time machine which has transferred you to the millions of years into the past. Behind you grow colorful castles of multilayer sand and clay rocks of the Paleogene period. They are all intricately eroded by rain. Green, gray, red, brown and yellow clay. On Ashutas travelers find ferruginated pieces of wood, plant residues. Among the rocks contained well-preserved prints of sycamore leaves, bamboo, hazel, walnut growing here neither more nor less than thirty million years ago. After a day full of new impressions we will stop for the night in the Buran village. We leave the hospitable Buran village and head to the shore of the Black Irtysh. Irtysh in Turkic means “excavation”. The name of the river was due to violent temper in its origins. Taking the start on the ice slopes of the Mongolian Altai, it is rapidly coming down from the mountains, and with the power erodes the shore. On the territory of Kazakhstan Black Irtysh has gradually brings its waters to Lake Zaisan. Here he is fueled by a variety of mountain rivers flowing into the same lake. Leaving a large natural body of water and at least a large artificial reservoir Bukhtarma affluent handsome loses in its title the term “Black” and remains Irtysh up to the meeting with the Russian River Ob. In the Black Irtysh, we will be able to swim and sunbath. For lovers of fishing will be available fishing. After lunch we will go towards the city of Zaisan. 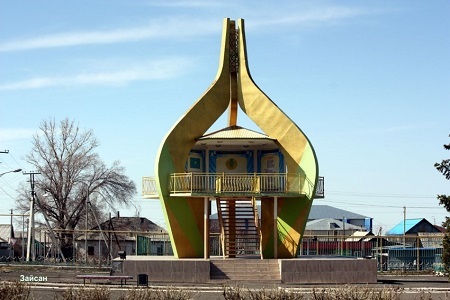 It is the administrative center of Zaisan district of East Kazakhstan region. Will admire the quiet measured life, clean streets and squares, and continue our journey. 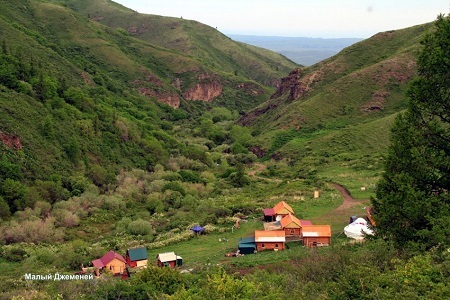 At this time our goal is a base camp in the tract Small Dzhemeni that is located on the slopes of the Saur ridge. In a picturesque valley, we can take a break from moving, have a dinner and spend the night in a wooden bungalow. In the morning we enjoy the fresh mountain air. Saur Mountains are a wonderful place where you can see the mountain and steppe bushes and larch light coniferous forests. And with special diligence reach the subalpine mountain, alpine short grass meadows and even mountain tundra. At the request of a group tour of the surrounding area of the base camp you can make either on foot or on horseback. During the trip, the opportunity to meet with such inhabitants of the Saur ridge as the red deer, roe deer, bear, wild boar. In the highlands, you can see ibex. And if you’re lucky, we admire from afar the representatives of a particular subspecies of Saur argali. In addition, it is necessary to mention that in these mountains was the last time people saw a snow leopard. Next we will have a small tour of the farm, where the pheasants are grown. This is a very beautiful bird. Especially males. Bright black and white and red plumage and long tail make an impression not only on females, but also attracted the attention of observers. In nature pheasant rather shy bird. They prefer to settle near water bodies in the bushes or in the woods. At the slightest sign of danger they hide in the bush. On their farm, you can see them in all its glory. Once pheasant reach a certain age at home, they will be released to free life. Thus at Saur Mountains people maintain and increase the population of this beautiful bird. After a long walk, we return to the base camp and stay there for the night. 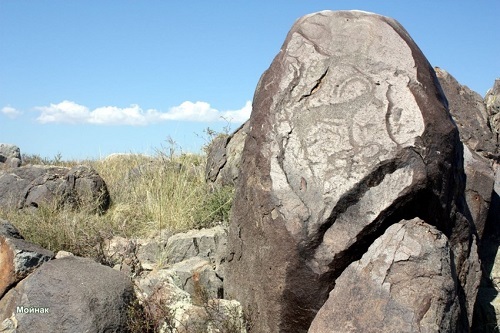 Fortified before the long move, a group of tourists from Small Dzhemeneya goes to the second-largest in the region, the complex of petroglyphs located in the tract entitled Okay. The coincidence of the name of the tract with a well-established in many English-speaking countries abbreviation “OK” is a random. It is situated near the village of Taldy on the hill, which is on the western and eastern side is bounded by deep gorges, and from the south by narrow intermountain depression. Ahead us waiting another historic site. This time we go to the tomb of Saka king at Shiliktinskoy Valley. It is in these mounds has been found the third Golden Man armor in Kazakhstan (Altyn Adam). However, if the first two mounds were discovered at Issyk and Araltobe and represented a garment created only for funeral rites, the Shiliktinsky armor was designed for everyday use. In addition, the armor has been executed because of gold instead of gold-plated parts. He had a lamellar structure, rather than chain mail. All this indicates that in this mound was buried not just a famous warrior, but a Saka great nobleman. Doctor of Historical Sciences Abdesh Toleukenov believes that under Tarbagatay ridge, was born a great culture of Saks, it is here in the valley Shiliktinskoy the so-called animal style was produced. Historical tour comes to an end. At the request of the travelers at night we can stay at the city of Zaisan or return to the freshness of the Small Dzhemeni tract. It’s time to return. On the way, we have the opportunity to visit another monument of nature – escaping from the general landscape of the steppe hills of loose rocks. Here imprinted traces of unseen living and growing millions of years ago animals and plants. The hills have bright red and mottled pinkish-brown color. That’s why this natural site called “Burning Adyr”. They truly “glow” in the evening sunshine. 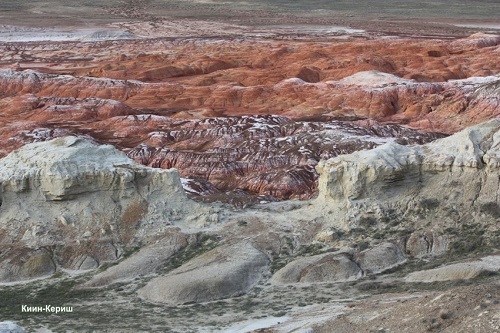 It is believed that such coloring clay rocks were formed in a hot and humid tropical climate of the Mesozoic. It says, that once on the territory of the East Kazakhstan were rainforests. In the middle of the last century on the Burning Adir we found dinosaur egg shells, and later repeatedly found the fossil remains of small ancient dinosaurs. We also will stop at a monument of Kabanbay Batyr at the border of Tarbagatai and Kokpektinsky areas. Let us make some memorable pictures, and go to the final point of our trip – Ust-Kamenogorsk.